We implore you -- get the .ISO from Microsoft. Don't use a shady source. 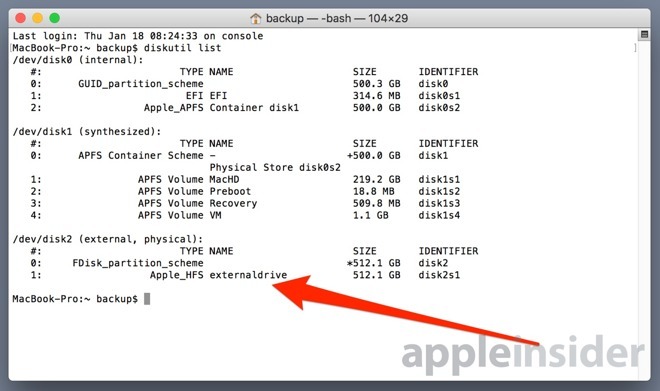 Making a Windows 10 install disk from macOS High Sierra isn't as simple as formatting a drive in Disk Utility and copying over files in the Finder -- you need to use the Terminal. So, mount the disk you want to make install media, and open up the Terminal. 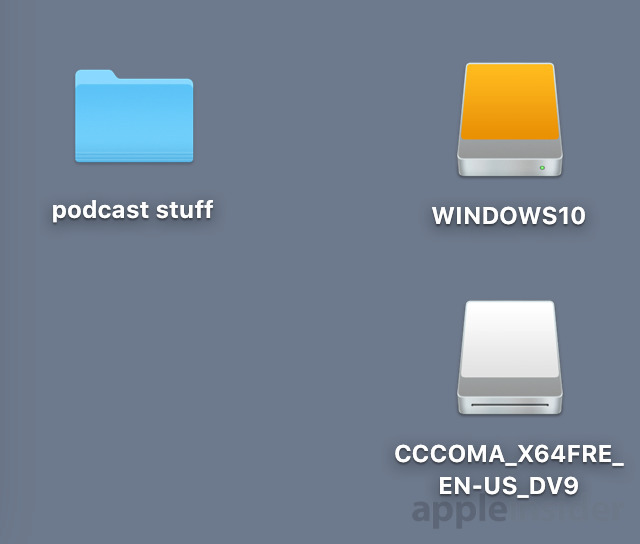 Find the name of the drive that you want to install the media on. Be sure that you've got this right -- because in later steps you can do massive damage to your boot drive if you're not careful. The Terminal will sit there for a minute, seemingly unfazed by your command. However, it is working, and after a period of time depending on the speed of your media it will complete unceremoniously -- but your data will be copied, and your media will be bootable. By the way, I've been using the free (open source) cross platform Etcher app (etcher.io) quite a lot for doing bootable Linux installs from iso files on to USB and SD/microSD and it works like a charm. I've never tried it with Windows 10 installs but I expect it should work quite well. Sadly, I had no luck using Etcher - it created the USB drive OK, but not in a format that would boot in a Windows machine. And I did change all the BIOS settings as needed. Ultimately, I had to borrow a friend's PC to do create a bootable version. Didn't have a chance to try the approach above. It would be great if you could edit/start this article to clarify "why" you might need a bootable Windows 10 installer, vs. just the .ISO. Are we ultimately trying to use this for Bootcamp, or is this step required if you're just trying to set up a Virtual Machine i.e. VMware, VirtualBox, Parallels? Genuine question! Bootcamp installs fine from an .ISO. Virtual machines generally do, but not always, so it might be helpful for that. It is probably of most use to a chronic troubleshooter, who has a running Mac and a dead Windows machine, and no good way to reinstall the OS. Or, if you just want to put the install media on a fast flash drive, instead of a DVD. 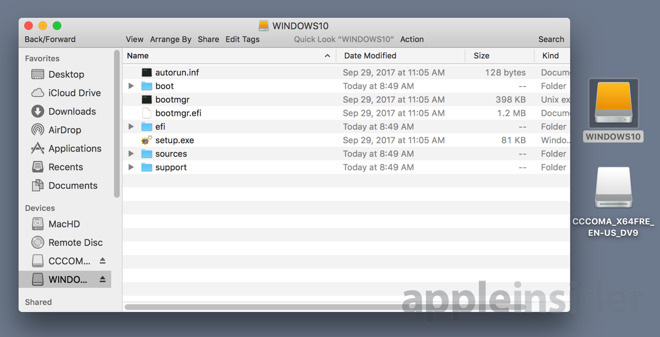 I was under the impression that given what they did to BootCamp Assiatant, if one was running one of the Sierra's, one could NOT install win10 into a bootcamp created partition... hence the instructions to have the install files on a bootable external volume. So if I mount the ISO, run Bootcamp Assiatant, it will leave me with a win10 installation without needing the flash drive I created with your instructions? I just saw this comment -- yeah, you can boot from the Windows install media you made from your Mac here, and reinstall windows over your perpetually repairing partition. If you add the v flag to cp -rpv /Volumes/CCCOMA_X64FRE_EN-US_DV9/* /Volumes/WINDOWS10/ you don't have to sit blindly and wonder if it doing anything. Windows is throwing an error: "windows setup windows cannot open the required file C:\Sources\install.wim". The problem is that sources/install.wim is 4.4GB which is more than MS-DOS (FAT32) format can handle. I tried to format my disk to ExFAT instead but unfortunately my motherboard doesn't recognize that. Any ideas? cp: /Volumes/WINDOWS10/sources/install.wim: File too large im using a 16gb usb. did everything as it was listed. im trying to make a bootable usb with windows 10 on my mac to use on my brand new pc.. The problem with MS-DOS format is that it has a max file size of 4GB, so obviously there's a problem when you try to copy the contents of the Windows 10 ISO because install.wim is larger than 4GB. This guide might have been written with an older version of Windows 10 in mind. I just ran through the process with ExFat instead of MS-DOS format and it seems to work fine. hisryanness above has it right. We'll edit the text today. I mounted the .ISO before my USB. On the final step, when entering "cp -rp /Volumes/CCCOMA_X64FRE_EN-US_DV9/* /Volumes/WINDOWS10/", I receive the message "cp: directory /WINDOWS10 does not exist", despite the fact that both have been mounted. Is there any way around this and is it caused because I mounted them not in the order that you stated? Sorry, please ignore my previous comment, I have now resolved this issue, what must I do next now that I have this USB? Jakes. Thanks for your tip on making the iso copy to flash drive with the v flag, because4 it is the flag for verbose mode which outputs what it is doing.